Scoop image – Lyndon Hood*****Today’s $665 million buy-back of the rail network from the Australian firm Toll Holdings is a genuine cause for celebration. For years, it seemed the privatisation of key assets carried out at the height of the 1980s market mania was irreversible. You know how the mythology used to run : private ownership was intrinsically superior, state ownership inherently inefficient etc etc. What a crock that proved to be. The assets were sold to corporate fat cats ( local and foreign) at bargain prices, then asset stripped and run into the ground, without much sign of foresight or planning. Or they were run so inefficiently ( in Air New Zealand’s case ) that the state had to come to the rescue. The buy back of the rail network is just one link – the bailout of Air New Zealand, the establishment of Kiwibank, the break-up of Telecom, the retention of Auckland international airport – in this long chain of correction. The deal will come into effect at the end of June, and will give New Zealand complete control of its own rail network for the first time in 15 years. It will allow transport planning to be properly and sensibly integrated – including even a revival of coastal shipping. Toll, with its commercial interest in fostering its own road transport options, was an increasingly ill fitting factor in any national transport – or energy – strategy. And where did the money for the $665 buyback come from? Quite possibly, from dividends paid by other state assets. In March, Cullen had signalled that the special dividend ( on top of $60.9 interim dividend ) from Meridian Energy would be used for capital purposes. Dr Cullen said at the time that the Meridian money would be used for capital expenditure of some kind – such as “trains and boats and planes”. It wasn’t the first time, though back in 2006, roading had been the main beneficiary of similar Meridian dividend. The Government used the proceeds of an $800 million special dividend from the power generator to help pay for a big transport package in that year’s Budget. In other words, energy sector profits are being used for the reclamation of state assets and for the building of transport infrastructure. A pretty ironic use of the energy reforms, and one Max Bradford could hardly have envisaged. Also, today’s rail buyback is yet another reminder that the impetus for modernisation in a small, easily captured market as New Zealand is rarely sparked by market forces. Telecom for instance, is only now – under the threat of genuine competition engineered by government action – embarking on a major capital investment programme, including the upgrade of its fixed network. Given the threats posed by climate change and peak oil, the rail buy-back is especially timely. To meet those challenges, New Zealand plainly has to integrate its domestic transport networks – road, rail and shipping – and strike a better balance between public transport and roading expenditure. That may entail a learning curve for Michael Cullen, first and foremost. Currently for every $1 being spent on public transport, $8 is being spent on roads. That ratio has to change, in rail’s favour. Supposedly, one rail line can move the same number of people/hour than 12 lanes of motorway, and can move volumes five times more energy efficiently than road. One final, cautionary note : the rail decision needs to be read in conjunction with the Clark Government’s signal that soaring fuel prices may cause it to delay the transport sector’s involvement in the emissions trading scheme – perhaps until after the January 1st 2009 planned date. This seems a very short sighted, election driven calculation. Delay in tackling transport emissions will not soften the eventual cost burden of those emissions on ordinary consumers, or on the economy. The Government’s message that regional fuel taxes will have to be phased in over a number of years is a similar piece of reality denial. Auckland Regional Council for instance, has already said it wants a 5 cents per lite on petrol, to help pay for the cost of electrification of Auckland’s rail network. Today, Cullen says he won’t agree to a full levy being imposed immediately. The political risk of hiking the cost of petrol now – and before November – is pretty obvious, but any delay creates a policy vacuum about the Government’s new rail acquisition. 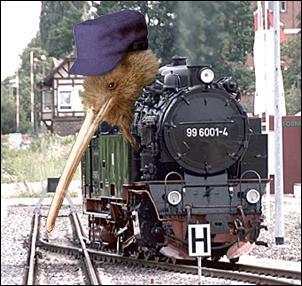 Does Cullen really plan to buy back the rail network AND fund its electrification in Auckland all by himself? No, apparently not. “Without that tax in Auckland, we cannot fund the electrification,” Cullen said today. “And that will be a major setback.” So, what’s going to happen? Clearly, Cullen may have his train-set back – but there are a few mysteries still hanging over just how he intends to play with it.